Large refrigerator/freezer & convection microwave oven above. 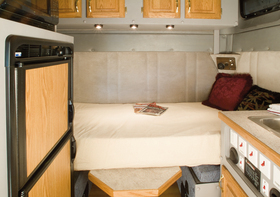 Bed/dinette with floating table. Large overhead cabinets on rear wall with oak hardwood cabinet doors. Stainless steel sink with oak hardwood cabinet door. Countertop with oak edge and bed/dinette with floating table. Large ovehead cabinets on rear wall with oak hardwood cabinet doors. 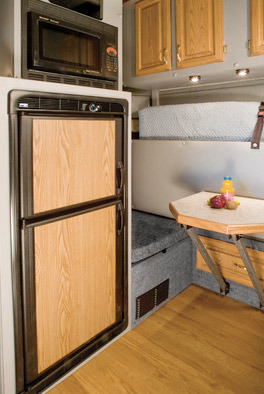 ARI also offers superior craftsmanship in the factory sleeper market. 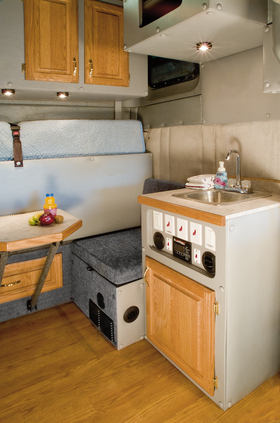 We can install Sinks, Hot Water Heaters, Showers w/Cassette Porta Potti, Microwaves, Invertors, Built in TV/DVDs, Refrigerators and Storage Cabinets. Because we custom build all conversions, we ask that you call and schedule a time to measure up your interior cabinets and get a proper quote. Click the link below to view more photos of factory conversions ARI has recently completed. Bed/dinette with floating oak edge table. Halogen lighting. Large overhead cabinets on rear wall with oak hardwood cabinet doors. 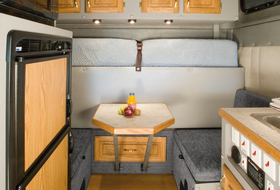 Bed/dinette in the bed position with floating oak edge table. Halogen lighting. Large overhead cabinets on rear wall with oak hardwood cabinet doors. Wide screen flat panel high definition TV with optional surround sound system!